Mr and Mrs Globe Trot: What's In My Suitcase? We have received many emails asking how in the world we packed for six months of traveling. It wasn’t easy. This was my first time traveling for such an extended period of time, so I can’t say I’m an expert, but I thought it would be fun to share my experience. And forewarning-- this post is intended for girls (from one girl to another). Boys just don't have these issues. Before the wedding, the last thing I wanted to think about was packing a suitcase for six months abroad. It would have been wise to pack far before the wedding and alleviate some stress. Rather, I saved it for the night before we left (which was 3 days after the wedding). I dread packing for trips like I dread the day after Christmas. More, actually (and unpacking is not better). But this was no weekend trip. This was a half a year, several seasons, too many countries. I needed to pack for active days of hiking and biking, as well as for hot dates with my studly new husband in swanky city restaurants. I needed to pack for winter and I needed to pack for summer. And if I packed anything more than one medium suitcase, I wouldn’t hear the end of it from my minimalist, backpacker man. I carefully considered what items I could sacrifice. I decided I could get by without a purse, without boots, and without a hair straightener. These were all bulky or heavy things that I could do without. I didn’t even think about leaving behind my laptop, iPhone, and a couple of books. Sure they were heavy, but I would give up some space to bring the things that would keep me sane. I packed a little bit of everything—shirts, sweaters, shorts, pants, dresses, skirts. But I think the trick lies in packing less of some items and more of others. I only packed one light jacket because coats are so bulky, but I packed several light sweaters and cardigans because I could layer them under the jacket in cold weather and wear them alone over shirts and dresses in moderate weather. I packed only one pair of jeans and one pair of black pants because pants take up so much room in a suitcase, and honestly I could wear the same pair of jeans for a week with different tops and nobody would notice. I packed a lot of dresses because they’re so light and easy to pack a bunch without taking up much room at all. They also work in warm and cool weather if you have tights/leggings and a sweater to throw on top. Not to mention dresses are just fab. I tried to pack items that could be dressed up or dressed down depending on the occasion. For example, a good thing to have is a top that will go well with a skirt and jewelry to go out on a date, but can also be worn with shorts and flipflops to the beach. I avoided taking anything that could only be casual (think a sporty Nike top) or that could only be dressy (think sequined, silky top). I took quite a few pairs of shoes, but made sure each pair could be worn with jeans and a dress (excluding my sneakers, which I wouldn't wear with a dress). Don’t pack things that don’t match with a lot of pieces in your wardrobe. Yes, that means leaving your abstract 80s shirt and fuchsia heels at home. I packed a lot of neutral colors like black, brown, tan, and white for versatility. This will help you create the greatest amount of different outfits with your limited wardrobe for an extended time. Neutral shoes, neutral tops, neutral belts, neutral accessories. Accessories—don’t feel like you have to leave them at home because they’re extra baggage. They really help you jazz up an outfit that you feel like you’ve worn a dozen times too many in the last month. Just pack the thin chain necklace, not the chunky beads bigger than gumballs. In addition to our suitcases, we each brought a messenger bag for our laptops. We also packed a small backpack so we could take it on day trips. Here I am going on about how I packed, but actually, Yuriy was the one with the small suitcase and I was the one with the medium suitcase. His packing job was incredibly impressive! However, we picked up some extra things once we got to Southeast Asia because we couldn't resist the cheap prices, so Yuriy had to upgrade to a bigger suitcase (same size as mine). We also added one more backpack because our suitcases were too heavy for flying (darn 20kg limit for checked bags). Now we each have one suitcase, one messenger bag, and one backpack. Not an easy load when there's a lot of walking involved (but it could have been worse). This is what our luggage currently looks like with our upgrades. * As already mentioned, I did some shopping in Thailand and added quite a bit to the list above to take home. I mentioned before that I didn't bring a purse, but I did bring a mini leather backpack instead. Best decision I ever made. It was the perfect size for a small camera, phone, money, notepad, and pen when going out daily. It's small and flat so I can easily slip it into my suitcase, unlike a purse which doesn't really flatten. A backpack is also much more comfortable to wear for a long day of walking rather than carrying a purse, not to mention my hands are always full with a camera. This little backpack was a $6 thrift store find! Must always beware when your husband is a photographer. -- We weren’t expecting to run into real winter weather, but when we decided to detour to Vienna, Budapest, and Ukraine in December, we were very much unprepared for snow. We had no choice but to go shopping for boots, hats, scarves, gloves, and winter socks. But I would rather do this than carry all that winter gear around “just in case” and then the weather never gets cold. -- I packed one dress that I always felt was too fancy (and no shoes dressy enough to go with it) so I never even wore it! Pointless baggage. -- I brought a hairdryer but found that it didn’t work anywhere because it was too much voltage to go through a foreign adapter. Instead of carrying the brick around for six months, I chucked it (it was really old anyway). I relied on hotel hairdryers or air-drying my hair (most commonly). Next time I won’t bother bringing one. If your hotel room doesn't have a hairdryer, ask at the counter--they sometimes have one to borrow. -- Don’t pack your favorite earrings because you’ll probably lose one by the end of the trip with all that packing and repacking. I did. -- Even if you pack the biggest bottle of your favorite makeup/lotion/shampoo, it will run out and you will have to accept an alternative until you get home. -- Don’t bring anything that wrinkles really easily. I brought one sweater that I rarely wore because every time I took it out of the suitcase, it looked like it had been chewed up and spit out. -- Bring lots of underwear! I ended up washing mine by hand several times when laundry wasn’t available. -- Bring a watch. I never wear a watch back home because I always have a cell phone on me for the time. When traveling though, I am usually without my cell phone, and so often need the time for buses, trains, and closing times. I was so thankful Yuriy always wears a watch. -- Toms are magical travel shoes. Super comfy for walking and they go with everything (dresses & pants)! 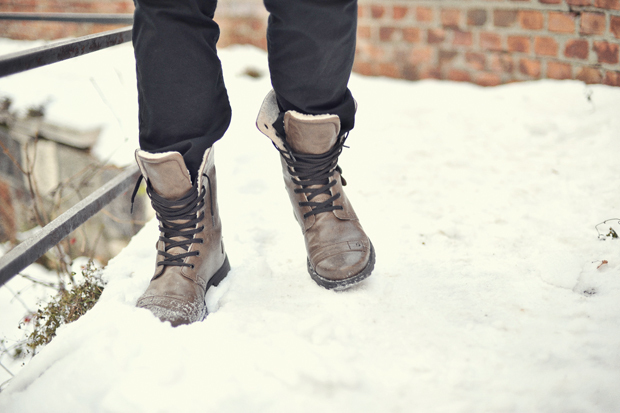 -- Try to pack some waterproof shoes. Everything I had sucked for rain (especially Toms). -- Having a roll of toilet paper is not a bad idea, especially in Asia. 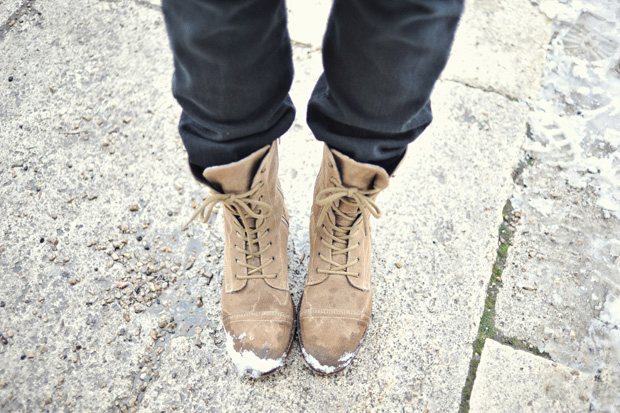 As soon as we got to Vienna and saw all the snow, I went frantically hunting for boots. Yuriy tried to tough it out, but gave in as well a few days later. SO glad we did because they came in even more handy in Ukraine where we often trudged through unshoveled snow (though they're now buried at the bottom of our suitcases). 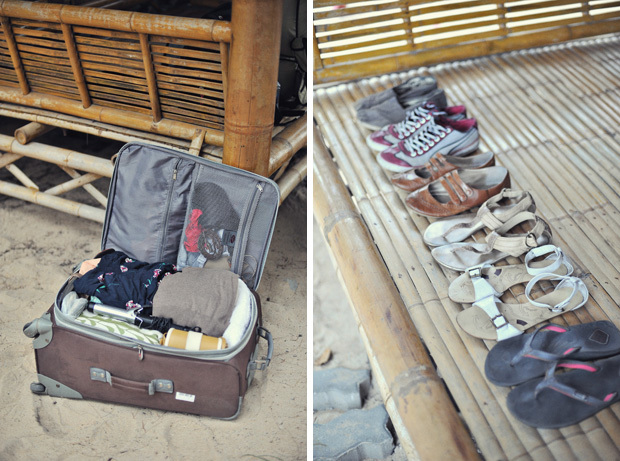 I still can't believe we pulled it off in such different seasons with just one suitcase each! I hope something in this post helped you in some way... or just satisfied your crazy curiosity. Are any of you going on an extended trip in the near future? Did I leave anything out? thanks for writing this post! i'm terrible at packing for a weekend let alone an extended trip :) will definitely keep your advice at hand. this is fantastic! definitely a great resource for any extended traveling. i need to go back and read it again! thanks, julia. this was so helpful -- thank you! i often go on (much shorter than 6 months) international trips, sometimes to a few different countries, and it's always a challenge to pack. i am impressed that you only picked up a few things along the way! 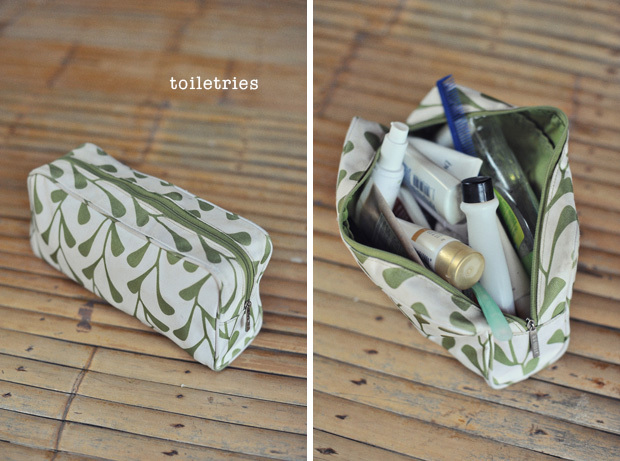 also impressed at how few toiletries you have (how did you manage? :) and i'm curious about your books. did you get rid of ones you finished, and how did you pick up new ones along the way? loved the post!! thanks for sharing! have a lovely weekend in lovely thailand! Great post! Awesome advice. I will be pointing my friends to this one for a long time. I'm packed up now for my 2 week Euro-trip with my husband, and I'm packed eerily similar to you. I'm bringing along 2 pairs of Toms though (they get stinky and might need a day to um, air out) and also my knee-high leather boots since it's still chilly over there. I have lots of neutral tops and cardigans, a pair of black pants and pair of jeans, and small black jacket for cold nights and mornings that can easily be thrown over my small messenger bag in the warmer afternoons. I think one thing I can't live without on a trip during cooler months is a couple of knit hats. For those inevitable days when my hair will look like garbage, it's indispensable, looks cute, and keeps my head warm to boot! Thank you for this post! I was so curious how you two managed to pack everything you'd need for 6 months. And having to plan for different seasons too, yikes! You make me laugh, Julia--you're a good writer, even when just writing a packing manual. Some great tips there. Plus, it helps to have a great sense of style to pull this off well! Funny you mention your minimalist husband griping--I never hear the end of it from mine if I pack too much, either. Which is a good thing, I guess, or I'd always bring way too much. I still kind of do. I so knew you'd eventually give in to the urge to bring at least something home with you--at least you saved it for close to the end of your trip. I love this peek into your suitcases Julia! I would have imagined much bigger suitcases for your trip but for 6 months this is very impressive A+ on the packing jobs. I can only imagine what your souvenir/postcard pile looks like in the backpack. If it were me I'd have to buy an accordian file folder to keep it all together! Hiya, this is a great post for me...thanks so much!! This is so helpful. As I am already racking my brain on what to pack for a 3 week honeymoon. I could nor fathom having to pack for 6 months!! Thank you so much for this post! It was extremely helpful. I see where I went wrong on my fist out of country travel. I really really loved this post. Super-useful and very informative. I wondered how you could travel for so long, in such vastly different climates, without bringing tons of baggage! There's nothing I hate more than bringing lots of clothes, only to wear 1/2 of them and feel like I carried around useless items. I will definitely be looking at this post on my next vacation! totally my favorite post from you guys. oh this is great! I'm glad we learned the same packing lessons! When I was in Italy, we got rained on while looking for a hotel. 5 hours I discovered that my suitcase had soaked through and my clothes dried with the funkiest smell imaginable. SO helpful!!!! After our May wedding, we are planning to go to Israel, Turkey, Egypt, etc.. and i had NO idea what to take, now I have a better idea:) Impressed by your logical selections.. Awesome post! lol... like your simplicity!! This is awesome! You're fitting A LOT into a carry-on! I was especially surprised at the jacket and boots since they are pretty bulky. 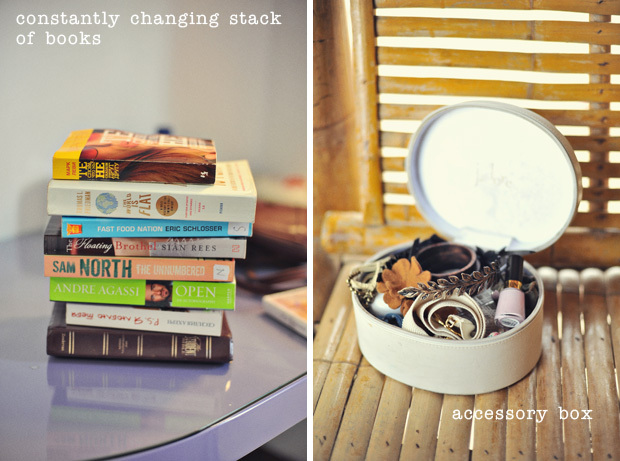 I guess long trips teach you a thing or two about packing:) Thanks a lot for sharing! this is truly inspiring! i love traveling light as well. thanks for sharing! so i over pack, a lot. this will really help me in the future. Thanks for posting! wow, this is a good post! i don't plan on going on any adventures like this anytime soon, but will definitely look back on this if i ever do! there's a lot of good advice here, thanks for sharing! and i love the photos with it. loved this post! such great insight into everything, you all are way better packers that I am - I'll definitely be using some tips! WOW! I love this post and will come back tomorrow to read it again! i'm in awe of this. i have trouble packing for two weeks trips to europe! i can't imagine 6 month trips to unknown places! i give you a lot of credit. so so SO helpful! i'm moving across the globe for a year (in 2 weeks!) so any tips/suggestions i can get i totally welcome. i LOVE seeing what other travellers pack and you have packed really well-all of that in one small suitcase? and you always looked pulled together and effortless in your pics. bravo. i have my own packing post going up in a few days too! hopefully i pack as well as you have! Are your suitcases able to be carried on or do you check them when flying? You two are such an adorable couple! I stumbled upon your blog a few weeks ago and spent time reading all about your journey from the very beginning. I so desperately want to go on an adventure like yours and hope to sometime soon after my husband and I graduate from college this summer. I can't wait to see the rest of your updates to see how the rest of the world was. Julie- Some hotels have free book swaps- leave a book and pick up a new one. Also there are plenty of used book stores around where we could sell the books we already read and buy new ones for cheap. There are usually tons of books in English. Amy Radcliffe- I guess Americans assume everyone knows what Toms are. Oops! I linked the post to the Toms website. Stop by Seattle and say hello on your trip! sweet pea- Awesome theme song! Thank you for sharing. backyardink- I was able to buy tampons in every country we visited. In some places (like around Asia) they sell them at the pharmacy, not the grocery store. They usually have only one sort though.. the o.b. brand. 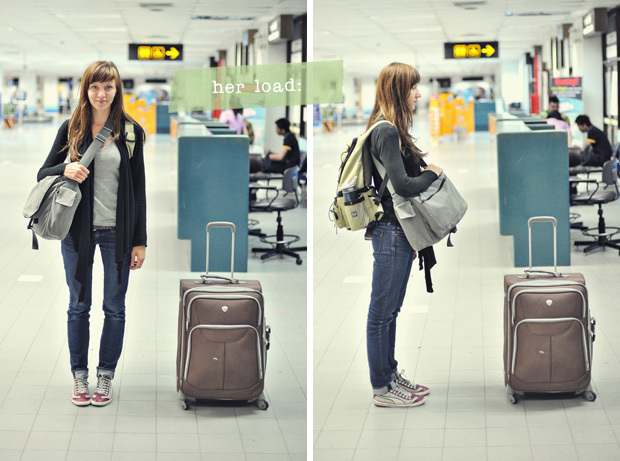 Alexandra- We check our suitcases when flying (they're too big) and take our backpacks and messenger bags as carry-ons. Juana- Good question (that I didn't cover)! We didn't do anything special to keep our belongings safe. We always had a private room with a lock, and we just prayed that it would be enough to keep our things safe. We also tried not to leave valuables out in the open. If we were leaving the room, we put our laptops and electronics in a drawer rather than leave it on the bed in plain view through windows. Hostels usually have lockers for free or for a small fee but they sometimes require your own lock, so be sure to pack one. On trains, we kept an eye on our luggage. If we were traveling by bus and had to part with our luggage, we always had our laptops/camera/electronics in a messenger bag near us. The suitcase didn't have anything valuable in it so nothing was ever stolen. Hope that helps a little. love this post!! it's like behind the scenes and what every girl needs to read before her big trip. this was wonderful, thanks for sharing! I love reading your posts and looking at your gorgeous pictures. You both are talented photographers! Oh, and I was an exchange student in Vienna and I would say my favorite city in Austria that we saw during our semester there was Hallstatt, Austria - I hope you get a chance to see it if you are passing by it. Rolling clothes is a must!!! Especially if you have synthetics , you could fit your whole wardrobe this way! ( almost!) if only one could roll shoes!!! Thanks so much for the post! My husband and I are heading off on a two month journey from paris - morroco - italy - down the croatias coastline - greece - turkey, and this list was super helpful! I love love my Toms, as well.... did you find that they "fit in" for europe? I think you both are fantastic. And not just because I'm half Ukrainian :) I just moved to Seattle...if you ever need a photography intern (unpaid even!) when you're back, I'm your girl! You two are amazing! I don't know how you did it.. those suitcases must be like the Mary Poppin's bag, ha! Very impressive. I hate the 20kg limit, too.. quite restricting (especially if you're moving!). I love that you love dresses... I'm sure that helped so much! Thank you for this post! I'll definitely have to keep this in mind for the future. Brittany Bless- Yes I've heard the rolling trick, but I can't find any of my clothes when I do that! We pack and repack so often that stacking it has been easier for us. Thanks for sharing. We will try to remember to check out Hallstatt next time we're in Austria. We barely had enough time for Vienna. Pete & Kimmy- We didn't see any Toms anywhere except in London and in Australia. But I still felt like they fit in since there are similar styles of shoes out there. Madeline- Perfect! Looks like we have much in common. We need to meet up in Seattle. Andrea- The backpack doesn't have a single tag or bit of text on it, so I have no idea. Thank you though! Yuriy laughed at me when I first brought it home, so now I get to rub it in his face that I'm not the only one who liked it. Awesome post! Those airport photos made me laugh. 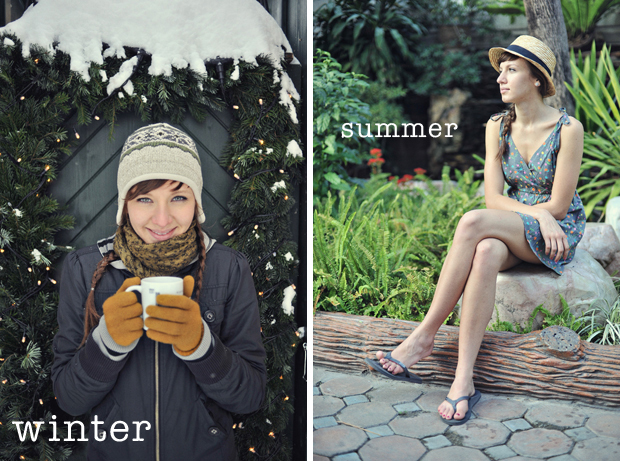 And I love the summer/winter photos. The captions were great, too. I'm also amazed at how you fit all those shoes! Good to know about Toms being great travel shoes. I got a pair for Christmas, but haven't been able to try them out yet because of all the rain. One question, in which country did you buy that tan/white crossbody purse?! I adore it! Jamie- I got my first pair of Toms as a Christmas gift as well! Now I'm hooked. I picked up the purse at the Chatuchak Market in Bangkok for about $7! Shopping in Thailand is amazing. love this entry. So cute! i had to save this post to my favorites, and i think it might save my life...or at least my sanity. i'm going backpacking in europe this summer for 5 weeks, and i am the WORST packer in the universe. we're talking duffle bags for a weekend trip. i'm going to follow and start memorizing your advice, so thank you so so much for this post! any other tips for fitting all of your life into a backpack? haha. 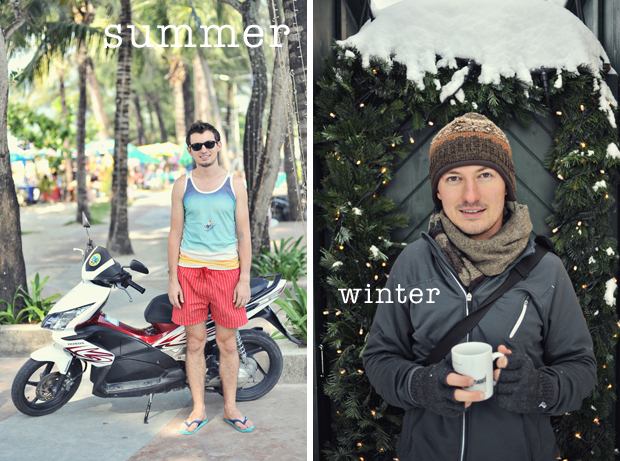 Ha haha, I think this is my favorite blog post you did, very interesting, and love what you wore this trip! Julia, I have to say, you have impeccable taste! 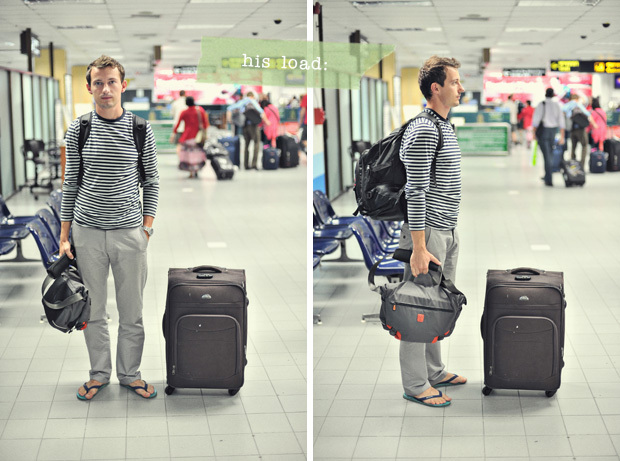 I love all your travel outfits and I would've guessed that your suitcase was the size of Mt.Everest. Needless to say, I am impressed beyond imagination! I think it's awesome how you reply to all your comments on your blog. It shows that you value your readers - very thoughtful and considerate. Here is another idea I thought of when I saw the picture of your pile of books. Now I know this is a subject of major controversy for book lovers. However, I think a Kindle/Nook e-reader would be really great for your travels. It's like an I-pod for your books. You can store thousands of books on this light weight e-reader. I actually bought a Nook when I married a German and knew I would be living in Germany with a limited access to English books in bookstores over here. At first I was really skeptical about the whole e-reader thing, but I found that it doesn't hurt your eyes at all. It's not like reading articles on a computer/laptop. It is so perfect for traveling or for my situation of living in Germany. I can buy English novels online to download for my Nook for only a fraction of the book's full price. Plus I don't have to pay shipping and handling. (So this has saved me thousands of dollars) There are a lot of classic books that are free or only cost $1.00 to download. Even newer book titles are priced cheaper for the e-reader. It's only a suggestion of course. I think it would save a lot of space/weight in your suitcase and you could always just go online and download a new book when you are ready. The battery life is also really good - like 7 hours and longer if you put it on "airplane mode." Sure there are certain books I would not like to read on an e-reader and would rather buy for my personal library collection. i.e. an atlas, reference books, children's picture books, cookbooks, textbooks or books that I would like to highlight/and take notes in, and probably more book genres that I can't think of at the moment. Question: Do you have an overseas insurance to cover you if you get sick? Have you or your husband gotten sick yet? e.day- I wish I had more advice that was actually useful in life. Have fun on your trip! Brittany- That's a really good idea. I saw a few people reading on e-readers during our trip, and you're right, I wasn't attracted to them because they don't look or feel like books. But now that you've highlighted the benefits, it seems like a totally logical and great idea. No we don't have travel insurance. Other than a cough and a some stomach aches, we've been okay, thank God! We've never looked into it.. is it a good idea? I'm not sure if my last comment sent or not? Anyways, earlier you said you liked to fold your clothes and be able to find the things you need fast since you pack and repack so often. As far as insurance goes, my university had all students doing study abroad, internships and field studies get HTH Worldwide insurance. I did get really sick when we went to Prague, but not enough to see a doctor. Later, fall 2009, I did a summer academy program to southern Germany and got deathly sick. HTH was a real lifesaver - I called the emergency number and they told me exactly what to do and what doctor was the closest that would be covered by HTH insurance. It saved me a lot of money in the long run (I hear it is super expensive to see doctors overseas). So insurance can be really handy when needed but might be seen as a bit pricy if you don't end up needing it. I would say if you don't have a lot of time left overseas to not worry about it. But if you still have a few months left, maybe look into it? Here is a short (and cheesy) youtube of the Eagle Creek Pack It system. Julia this is so helpful even for shorter vacations...I usually end up packing tons of stuff and half doesn't even make it out of suitcase. By the way where do you go thrifting in Seattle? That little backpack is great! :)And love all your pictures...just amazing! Nella- I go thrifting at all the basics in Seattle-- Goodwill, Value Village, Salvation Army. Mostly Goodwill because they have the most stores. Goodwill Outlet downtown is gross but super cheap and sometimes awesome. Faith- We're flattered. Thank you. We're thinking about making a photo book at the end, but I don't think we're nearly experienced enough to make a travel guide. We'll only be there in Oct. but this was most helpful!!! So I am one of the individuals that just came across your blog somehow, and I have lived in Europe from 2 suitcases for 4 months once. And traveled quite a bit, and I must say that your advice was terrific! Wish I had known more of that before I had traveled! I have enjoyed getting to know you through your blog, the magic of the 21st century and how strangers can somehow know where eachother is in the world and what they are doing :) Thanks for sharing! This stranger appreciates it! Ya seriously..I read this on my train ride home from Seattle, wA, and its like the cutest post ever. Great things to know for future..
Julia....this post was incredible! I am the world's worst packer. I always feel like I need to pack for EVERY scenario, so my suitcase for a quick weekend trip always looks big enough to last me a month. This is such great advice...I definitely want to bookmark this post as my fiance and I plan to do plenty of traveling together once we are married next year! this post was awesome! everything about it was informative and visually beautiful BRAVO! i adore this blog and hope someday i can copy your 1/2 year adventure! soooooo jealous! Casey- We didn't go to Spain. I wish! You guys are amazing for packing your lives into such tiny suitcases! I thought I was a light packer! Thanks for such a detailed post! Carrie- My sneakers are Pumas. I didn't want to bring tennis shoes because they are pretty bulky and don't collapse (bad for small suitcase). These Pumas were perfect because the shell is not too bulky, but the sole has a nice rubber padding and arch support. Not the IDEAL shoes for a lot of walking, but pretty close. I hope you get the job too! What an experience that would be.
" -- Don’t bring anything that wrinkles really easily. I brought one sweater that I rarely wore because every time I took it out of the suitcase, it looked like it had been chewed up and spit out." If you do end up bringing something that wrinkles, putting it in the bathroom and having a steamy shower and letting it lay flat dry or hang dry will usually get the wrinkles out, depending on the fabric. Julia, I'd love to ask where you purchase most of your clothes? (or at least the bulk of them) Especially your dresses, they're all so pretty. Thanks for this post. I'm traveling for a year, but I'll be in warmer climates. Only Iceland and Sweden, but summertime are cooler. I'll be in Europe until October, then Ghana, South Africa just after Christmas, Australia and Southeast Asia until this time next year. Would you say that your 6 months of packing could have lasted you another 6 months? I'm sure I can exchange things as I go, but I don't want to spend a whole lot of money on clothing. Amanda - I did exactly that a couple times with a sweater I had that wrinkled very easily! It helped. Amanda II- That's sweet. I buy some used clothes (usually only dresses/accessories) at second-hand stores. I don't have a go-to store but some of my favorites include- Macys, Nordstrom (& Rack), Target, H&M, Urban Outfitters, The Loft, modcloth.com, shopruche.com. I don't spend a lot of money on clothes. Jeweli Anne- Yes, my packing would have definitely lasted another 6 months. We didn't pack adequately for winter weather since we weren't planning on it. If we did it over again, I would have packed a better coat and some warmer things. That shouldn't be a problem for you. That's the beauty of visiting only warm places-- less packing. Your trip sounds amazing! Have a great time. Omg this has been a life saver! I never know what to pack n normally pack to much! I need to pack a little for both seasons n now I'm not worrying bout it as much! This post is great. I love reading other bloggers packing lists because I haven't travelled for an extended period of time...yet. I'm hoping to change that soon and in the meantime posts like this are so useful to help plan ahead. You both look amazing in every single picture so your advice is definitely valuable to your followers who want to travel in style! where did you buy your beautiful leather backpack? Where dis you buy that beautiful leather backpack? Where did you buy that beautiful leather backpack? Ximena - I bought it at a thrift store. Sorry that doesn't help much! This was super helpful to read! Thanks so much! As a study abroad student, packing is definitely a compromising situation. Loved hearing how you did it! Loved this post ! Im packing for a 6 month trip to ecuador .some things were very helpful & others not so much. like heavy winter items . I will be reading this again soon . Thanks so much ! My husband and I were married last month and are currently planning for our 6-month honeymoon to Europe. He insists we take only backpacks and a messenger bag each (carry-on only). Before this blog, I assumed I would never be able to wear cute clothes n just be in the same jeans and shirt for 6 months. However, this blog gives me hope. I'm doing a mock-pack this weekend! Thanks for all the advice! So glad to have found this blog and a couple who has done exactly what we are planning! Victoria - So happy to see other couples taking extended trips! You will be talking about this trip fondly forever. Happy travels! I really love your advice! It's nice to have this information. Thank you! Awesome post, thanks for sharing! super useful! Sarah - We use a Nikon D700 + Nikon D800 for all the photos on our blog. Occasionally, we'll use our Fuji x100s when we don't feel like taking the big camera. You're a life saver thank you! Thanks for sharing what's inside your travel suitcase. :) Traveling with the family is indeed a worthwhile activity. really good photos!!!! I like your style! thanks so much for all this comprehensive advice!! live with a very small amount. Very good lists! This was absolutely fantastic! So incredibly thrilled to have found this. I'm moving to the Caribbean for 6 months, so packing should be even simpler than this since the climate is always the same. Again... THANK YOU THANK YOU THANK YOU. Thankyou!!! This really is a great help! I am orignally from England but I have lived in New York for the past 7 months I travel to India in 1 month and then move on to China for 4 months and after that i am travelling to cambodia, vietnam, thailand, laos, indonesia, Malaysia to end my trip!! And this really is a great blog for packing!! I am just looking at my wardrobe now thinking what on earrrth am i going to take - and being a fashion student doesnt help me either!! Thanks - great blog and very helpful. I'm going to Europe in May, only for 2 months, but will cover chilly early spring in Russia, then hot summer in Italy. Could I ask please what the capacity of your suitcases were - cubic litres, or what ever you use in the US. What brand of suitcase do you both have? This is great! I am going to Maine for 3 months and was so lost as to how I was going to manage packing for that long, but this blog really saved my life. Now I'm not completely terrified... only a little :P Thanks for writing! This is a bit late, but I referenced this post when my hubby and I took our honeymoon of 6+ weeks through Europe (Bosnia/Croatia/Italy/France/Scotland/England) and went through 2 different seasons (summer and fall) all in our backpacking packs. So much useful information, thank you! I definitely relied on hotel/Air B and B places for a hair dryer or just air dried my hair (I cut it too before the trip so it was easier to deal with). Packets of Tide laundry detergent were my life saver for the days I had to do laundry by hand in the sink. And I definitely recommend travel insurance - especially for extended trips. It was relatively cheap for a piece of mind in case something happened to us. Already planning our next trip! this is so far the best post on travelling that i've found. Great post! Would you mind sharing the brand of luggage/messenger/camera bags you used? Brilliant!! This post was wonderful - my name is Julia too, and I'm about to study abroad for a semester in Spain. Packing is sooo hard. Thanks for all the tips! Amazing article. I love your photos. The idea of packing clothes in neutral colors is fantastic! I am going to visit Greece next month. Rhodes is the first place I will visit. I adore your photos from there. Best regards! Nice one. If anyone among you is fond of travelling around the places then you may also include a detailed road map along with your other stuffs. If you are planning to visit the beautiful country of Spain then you may take help from the Spain Road Map to find your way easy in that country. I'm studying abroad for 4 months this spring, and during my semester I have a 5 week spring break to travel around Europe. The is the best article I've found so far, and I love following you two on Instagram. Thank you for your insight! Nice packing idea. If you are planning to visit any place then you must not forget to keep the detailed road maps along with you. If you are planning to visit Spain then you must have the detailed Spain Road Map along with you to help you find your destination.